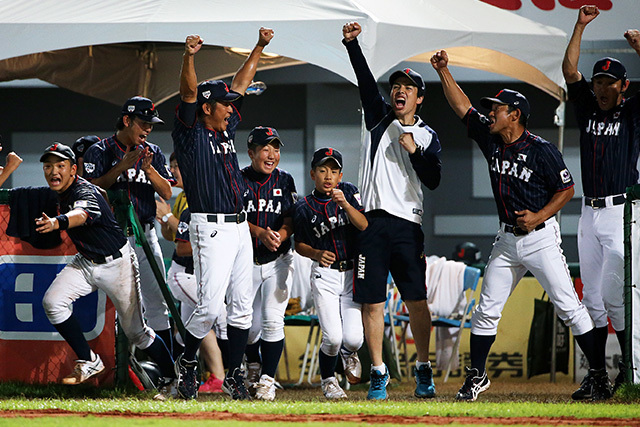 Japan beat Chinese Taipei (7-5) thanks to a strong comeback and has now a chance to get to the second round as the number one seed in group A. They just need one more win against Brazil on Thursday 3 August early morning game. In that case, Chinese Taipei and Mexico would follow in this order. In the case of a Brazil win, Chinese Taipei would be first and Mexico second. The game between the Asian powers had 2 faces. Chinese Taipei took the lead in the bottom of the first. thanks to usual suspect Pai Chen An (playing DH because of the double header; Chinese Taipei had beaten Mexico 10-0 earlier today), who hit an RBI single. In the bottom half of the the third Chinese Taipei scored more. With 2 outs, second baseman Han Shuo Heng homered to left on the fourth pitch by starter Yamada. Japan moved Minamizawa from first to the mound and Sun Yi Lei, who took Pai spot in the line up, welcomed him with a base hit to left. He then stole second and scored on a deep double by Kuo Shu Wei. Left fielder Liu Wei I scored the fourth run by Chinese Taipei in the fourth, when he singled and managed to steal second, third and home. When it looked like they were beaten, Japan came back. In the top of the fifth, with one out, Kuo Shu Wei walked catcher Mori and right fielder Toi, then left for Chien Yu En. Yamaguchi turned the newcomer’s third pitch into a 3 run homer to right center. In the top of the sixth Chien Yu En walked both shortstop Tokunaga and center fielder Okada. With one out, the ball went to Tseng Yi Wei. Mori welcomed the left hander with a base hit to right that loaded the bases. With Chinese Taipei infield in, Toi hit a blooper to tie the game. Chinese Taipei sent Yang Sheng Wei to the mound. The reliever got started with a wild pitch and then allowed a base hit to Yamaguchi to give Japan a 6-4 lead. On Minamizawa grounder, Chinese Taipei failed to turn a double play and Japan added a run. Chinese Taipei did have their chance for a comeback in the bottom of the sixth. But after scoring on a blooper to left by Yang Sheng Wei, they lost a runner at home (second out) and Yamaguchi got a grounder from Chien Yu En for the third out.